Project obstacles and solutions: Celadon conducts CDL training with drivers of their over-the-road semi trucks and trailers at their Indianapolis Training Center. The facility operates six days a week, 12 hours per day. The old pavement at the center was badly rutted. E&B Paving was hired to replace the pavement with roller compacted concrete pavement (RCCP) to manage the constant movement of heavy trucks. Since the training at the center could not be shut down during construction, it was important that E&B work quickly. The IMI Post Road concrete facility supplied imix Roller Pave roller compacted concrete for the project. RCCP is designed to pave and turn over quickly for usage by heavy weight traffic. The paving was planned in two phases so the trainers could still operate on half of the facility. Within two days, E&B had Phase One completed. 48 hours afterwards, the semi school had moved to the newly poured pavement. Phase Two was also completed in two days. IMI supplied a total of 5,200 yards of imix Roller Pave roller compacted concrete for this project. 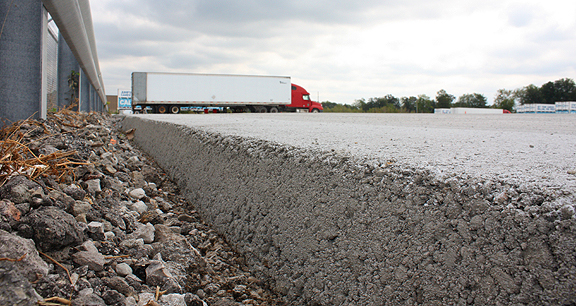 With any high performance, specialty concrete, design mix and field testing are crucial. With very limited time and very tight tolerances, IMI QC/QA were on hand to assure that the concrete was performing to specifications and there was consistency from one truck to the other. RCCP is a very dry, zero slump mix that must be transported to the site via tri-axle dump trucks, then loaded onto the paver. With a tight deadline and large coverage area, the supply of imix Roller Pave had to be continuous throughout each phase of paving. IMI supplied up to 130 yards of concrete per hour for 10 hours per day to keep pace with the paving demand. The Celadon Training Facility was fully operational during the entire paving process. All of the training lot was being used 48 hours after E&B completed the paving project. For more information on imix Roller Pave, click here.